Based on the initial griping of mine, you might wonder why I would go back to Orlando, especially so soon after the previous visit. Of course, you probably weren’t wondering that. Instead, you were content to sit passively; simply reading what is in front of you with no response. Would it kill you to participate once in a while? Lazy bastards. But yeah, if you hadbeen wondering that, you would be raising a pretty good point. Quite simply, even though there is so much to complain about, Orlando cuts out all of the unnecessary vacation crap. No historical monuments, no meaningful landmarks, almost nothing of substance. It eliminates all of the foreplay, and cuts right to the fun. Usually. There are little to no billboards for local businesses along the sides of major roads. This is because almost every single sign throws a bright, licensed character in your face. The Hulk, Mickey and Donald, or a twenty five foot high wide image of Shrek’s face. BAM. Right there, screaming, “Look at me! LOOK AT ME!!! AAAAAAHHH!!!!! !” Not literally, of course, although I wonder how long it will be before ads like that come around. I had been ready to go for a while. Mostly because my girlfriend, Amy, was in charge of all of the planning for the trip, and feels the need to plan for things approximately ten months in advance. The trip down was fairly uneventful. The security at the airport seemed to be a lot less insane since the last time I had been there. I only saw one bag being searched, as opposed to the dozen I saw on my previous airport trip. They also didn’t give us the terrorist questionnaire: “Did you pack your own bag? Has the bag left your sight since you packed it? Did any stranger ask you to carry a package on board?” They knew not to ask me such foolishness, because if they did, I would poke fun at them and make them cry. The flight was joyous, mostly because I had purchased the new collection from “The Onion,” and their books provide me endless amounts of happiness. They do, however, make for awkward reading in public places, since they make me laugh out loud (LOL,) literally, on a regular basis. I mean they make me actually laugh out loud; they don’t actually make me say the word “Lol.” I reserve that for special occasions. And of course, there was no ROFLing. The pilot hadn’t turned off the fasten safety belt sign. Awful joke. The majestic airplane “snack” had arrived, tomato juice with lemon and biscotti (high class deluxe,) but I was still pretty full from my breakfast, which consisted of sushi and Lunchables. The rest of the flight was spent reading and imagining the plane crash scene from “Fight Club” every ten minutes. You know, the usual routine. 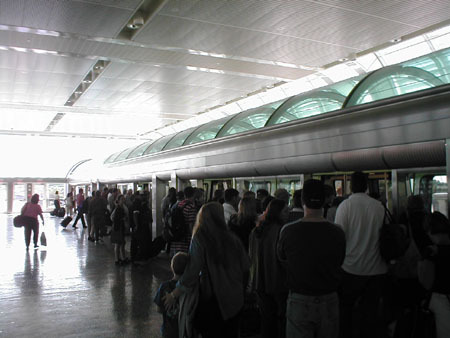 The Orlando airport is one of the more peculiar airports I have been to, mainly because it has a monorail. That simply screams “unnecessary.” I didn’t even notice why there was a monorail. I think we went over water, and the airport is actually two big buildings, connected by the monorail track. I can’t say for sure, I don’t honestly remember. I’d like to think that is the reason, since that would lend some sense of normalcy to having a monorail, which is something considered to be tacky even when used by Disney. They are actually building a monorail near where I live, but it does, surprisingly, come close to being useful. It will be used to connect major train stations, at least one airport, and a few other points of interest. Although this is being built in New York, so in order to estimate the date of completion, you would probably have to use some sort of logarithm functions. Monorail aside, the Orlando airport was fairly normal; nice, even. It had a full hotel inside, where the hallways and doors to the rooms were exposed to the main lobby area of the airport, which really just seems like a terrible idea. I can understand where the architect was coming from, some sort of visual novelty approach, but I would never, ever want to stay there. I assume most of the rooms are used by people who were bumped from the routinely overbooked flights. Also, the reason I didn’t take a picture of the hotel is because I was still shy about picture taking in an airport, since the last time that happened, I almost went to prison. To my surprise, there was no shuttle. Instead, there was a cab. I hate cabs. When the driver is rude, I sit there irritated, itching to get the hell out of the car. When the driver is friendly, I feel guilty for making them drive me around. I couldn’t really tell which category my driver fell into. This is because I couldn’t make out 95% of what he was saying. He had some sort of thick Jamaican accent, and not the “Ay mon, be cool we jammin’” type of accent. Just the unintelligible drawl that turns the simple task of figuring out what they are trying to say into an adventure. Since the ridiculous cab fare was a surprise to me, my trip budget took something of a turn. I had (very) poorly thought out how much money to bring in the first place, clearly exemplified by the fact that I didn’t really factor in paying for the hotel. So after the cab fare and hotel bill, I was left with the startling realization that I had no money. I am not exactly what credit card companies consider to be a “good investment.” Therefore, if I was to have my own card, the interest rates would be approximately 65%. As a result, nearly all of my money comes in the form of cash. Kind of like a drug dealer, but without the whole “lots of money” aspect. Since nearly all of my money was spent by the time I was checked into the hotel, my budgeting definitely needed to be reevaluated. After some juggling of bills and other fiscal rearranging, I was able to have enough money to not have to eat ramen noodles for the remainder of the trip. Unfortunately, as a result, my churro allotment took a big hit. How adversely this would affect the trip was yet to be seen.